HUNTER roads may be built with an asphalt containing recycled soft plastics collected and recycled in the region as early as 2019 thanks to a community program driven by a Warners Bay business. The Plastic Police program was started by Cross Connections, which helps businesses divert their waste from landfill. The program collects soft plastics — easily scrunched plastics like chip and biscuit packaging and cling wrap — and recycles them for end market products including furniture. Overwhelmed by the amount of soft plastic generated by her own family home, Cross Connections founder Samantha Cross began the scheme in 2015 as a personal project to help her community in Biddabah, where her children attend school. 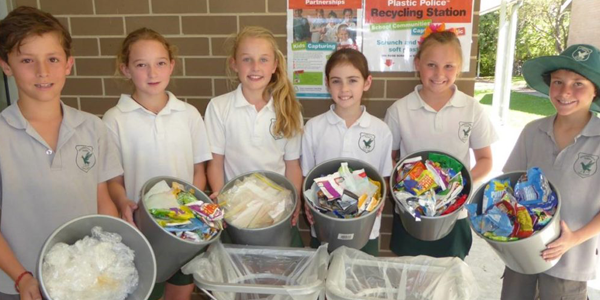 Biddabah Public collected 1134 kilograms of soft plastics over a year, with some of it used to make a bench seat in the playground. A raft of partners have since joined the program — including local councils and businesses including Hunter Water and Quarry Mining — and it recently contributed 40,000 pieces of soft plastics for lab trials to develop a new asphalt additive called Tonerplas. Made by Melbourne firm Close The Loop, the Tonerplas is used to make Plastiphalt, which is being developed by Downer E.D.I. Plastiphalt will be used to build a road in Sydney’s Sutherland Shire and Downer EDI is about to start construction of a $5 million asphalt facility at Teralba that will enable it to make Plastiphalt in early 2019. “[The new facility] will be able to produce asphalt that can incorporate significant quantities of recycled materials,” said Downer executive Stuart Billing. Mrs Cross said Hunter councils would be able to use the Plastiphalt — which she said lasted 65 per cent longer than traditional asphalt — to build and repair roads. “The Hunter has the opportunity to be put on the map because we are the only region that is a collaboration of schools, businesses, councils and manufacturers to tackle this issue,” she said. The Plastic Police is planning a regional pilot to allow more councils, schools and businesses to participate.